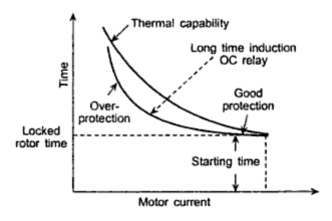 Thermal overload relays offer good protection against short, medium, and long duration overloads but may not provide protection against heavy overloads shown in Fig1. The long time induction over-current relays provide good protection against heavy overloads but over-protection against light and medium overloads, as shown in Fig 2. 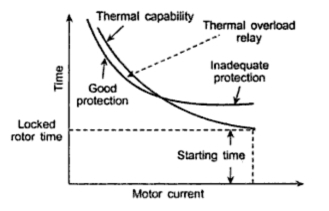 Therefore, a combination of both the relays provides adequate protection as shown in Fig3. Fig. 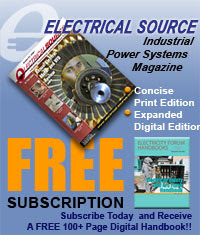 2 Long time induction OC relays offer good protection against heavy overloads. These relays operate from one or more RTDs that monitor the temperature of the machine winding, motor or load bearings or load case. They are usually applied to large motors of 1500 HP and above. Figure 4 shows an RTD which is embedded in the machine connected to at a Wheatstone bridge. The arms of the bridge are adjusted so that the bridge is balanced at normal temperature. A sensitive relay in the form of a contact making dc galvanometer may be connected as a detector. Fig. 4 RTD embedded in the machine connected to a bridge. The RTD is an excellent indicator of average winding temperature, however, it is influenced by ambient temperature, ventilation conditions and recent loading history. Several types of RTDs are available for use in temperature monitoring, namely 10 Ω copper, 100 Ω nickel, 120 Ω nickel, 120 Ω platinum. Replica type relays are designed to replicate, within the relay operating unit, the heating characteristics of the machine. 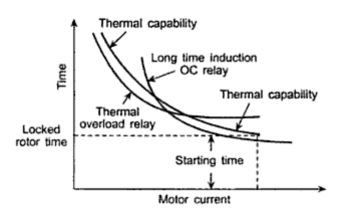 Thus, when current from the CT secondary passes through the relay, its time over-current characteristic approximately parallels that of the machine capability curve at moderate overload. 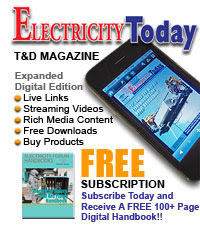 The thermal replica relays are recommended when the embedded temperature detectors are not available, otherwise the RTD input type relays may be used. Replica relays are typically temperature compensated and operate in a fixed time at a given current regardless of relay ambient variations. Although this characteristic is desirable for the stated condition, it produces under-protection for high motor ambient and over-protection for low motor ambient.